there is just something special about Budgies, Cockies and Galahs. They are cheeky and charming. I know they make a mess (when we lived in the hills, they used to strip the new green honky nuts from our gum trees, eat the best bits, and spit their left-overs on the ground. This made it quite dangerous - especially for a clumsy-clot like me - I was always tripping over gum nuts!) but despite this (and a few sprained ankles!) 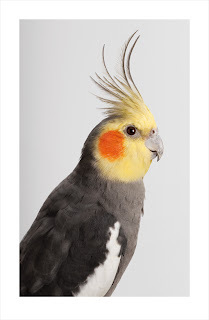 I reckon no other bird comes close as far as character is concerned. Have you seen Leila Jefferys beautiful photographic portraits of these guys? Pop over and have a look, they'll blow you away - even if you're not a twitcher. see what I mean about character?! 2. Dana from mid 2 mod - you're in the pink. 3. Annie from Artistica Domestica "Miss Poland" is yours. 4. Middle Aged Mum it's time to put the kettle on. You are SO generous...and my favorite Santa. :) I'm so excited about the pink TT. Moi? WInning!? Miss Poland is quite the jolly floral. Thank you so much! 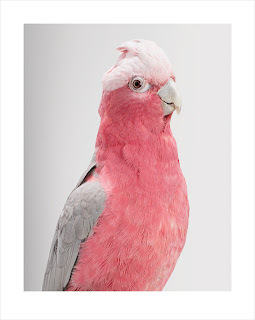 I'm a big fan of the pink galah. Childhood memories out west and all that. Congrats to the winners. Lovely bird tt. I do like budgies. I've got a budgie pendant which I'm very fond of. When I was little I used to get 10p a week pocket money and it took me ages to save up for a budgie (Joey) and a cage (both £2 each). Poor Joey lasted two weeks before popping his clogs. Boo hoo. Squeeeealllll. Who knew winning a teatowel would be this exciting. Thank you Kylie! I love it! I do! Yipppeeeee!